I am more than a little enthusiastic about Spring and the wildflower cycle coming full circle again and while listening to some REM the other day thought I should make a photography collage of recent wildflower photos and put it to "The Flowers of Guatemala". The photos are mainly from the South Fork of War Creek, Buttermilk Ridge, Mills Canyon, Boundary Butte, Blag mountain, Sauers Mountain and Horselake Preserve. I had 90 different photos but had to whittle it down to fit the song time frame. Thanks for another fine video, wildernessed. I spotted some salmonberry blossoms yesterday on the west side, can't wait for lupine season! May be heading east tomorrow in search of sun and flowers! Yeah it is overcast and raining lightly right now hopefully better weather tomorrow. Hmmm...some of those scenes look familiar. A nice reminder of what's coming soon. Nice! Fun to see all these beautiful flowers after watching the snow fall this morning! Definitely getting in the mood for spring. We had flurries this a.m. and it looked unsettled outside of the valley. The hills look slightly greener. It was sleeting and snowing intermittently here all morning, so we decided to give the east side flowers a few more days before we head over that way. Looking forward to seeing those green hills too! First Balsam Root I have seen this season. 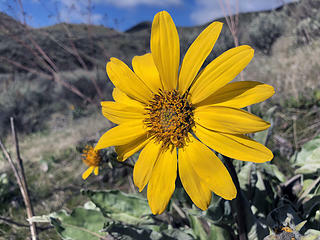 Balsamroot starting to show a few early flowers in the Gorge, saw four poppies as well. No lupine yet. Fresh snow on Underwood and Burdoin mtn's this morning, all melted off now. Defiance got a better dose, still there at lunchtime above about 4000'. Did a loop in Sage Hills - Horselake Reserve yesterday pretty dull out with the overcast but quite a few Buttercups, Yellow and Blue Bells, some Spring Beauties, and scattered Balsam Root. After the coming rains add sun and we should start to see some nice coverage. 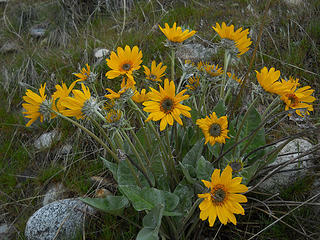 We saw some balsamroot close to the road in Oklahoma Gulch yesterday, but it’s not ready to bloom higher up. 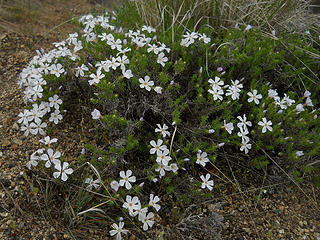 I only saw one of these, is this a heather? That is Phlox. Here is a good list of flowers for that area.